Open up your living space. How about a bespoke house extension that’s also a dining room? Would you like a breath-taking kitchen orangery extension instead? Whatever your reason for needing more space, Ultraframe has it covered. Our thermally efficient and regulation-approved components are precision engineered off-site for a quick, fuss-free and elegant modular extension that’s warm, welcoming and flooded with light all year round. The combination of our Classic Roof design and performance glass, with masonry piers or super-insulated columns, gives the feeling of solidity plus the thermal performance required for an extension, while the glass roof gives the light and feeling of space to deliver the real ‘wow’ factor. Livinroof house extensions blend the benefits of solid conservatory roofs and glass conservatory roofs. The Livinroof allows homeowners to add glazing wherever they want to and in any shape. Achieving an outstanding design is easy with this flexible system that can be used to create a focal point in your new room that will help it stand out. Ultraroof house extensions fuse the thermal properties of brick or super-insulated columns with the ultimate in lightweight tiled roof solutions. The Ultraroof offers a magnificent vaulted plastered ceiling on the inside with authentic looking lightweight tiles on the outside. Insert full glazed panels to deliver light and a stunning feature. 5 Times more thermally efficient than a brick column, these clever insulated columns will reduce heating bills and the plastered finish adds a cosy room like feel to the interior. Create a 'room like' feel and reduce heating bills. The insulated pelmet runs around the perimeter of the ceiling, a critical area of heat loss. You can even add spotlights and speakers. With the central lighting panel, you can add your choice of light fittings to the central roof ridge. Insulated for added warmth, the panel can also be painted to match your decor. Five times more thermally efficient than a brick column, these large grey columns in a fluted finish are available in any colour to match or contrast with your property. Also available in a flat finish for a more contemporary style. A curved cornice in anthracite grey adds style and shape to the roofline and hides the gutters. Available in any colour, there are four styles of cornice to choose from. Your new room will come equipped with enhancements designed to create incredible aesthetics and deliver outstanding performance. The flexible construction of our roofs means that you’ll be able to choose a building style that’s right for your house extensions project. The high-performance glass used in our roof systems will turn your new space into a 24/7 living area. Enjoy a room that’s the perfect temperature throughout the year. Our market-leading roofs excel at preventing heat loss. Enjoy a room that’s perfect for entertaining or relaxing and which is economical to run. Our products have been designed and thoroughly tested to ensure lasting quality. If there’s an issue, you’ll be covered by a 10-year manufacturer’s warranty. 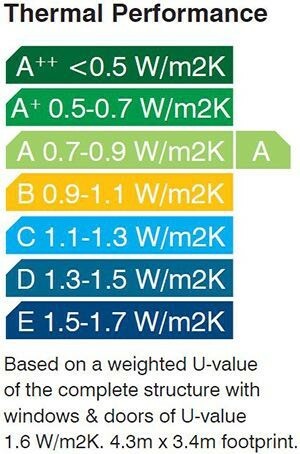 Your Ultra Installer will be able to tell you more. Enjoy a thermally efficient room that looks stunning from the outside and the inside, thanks to the many carefully designed features that come with it as standard. Instead of providing a single design option, we’re able to introduce our customers to a range of choices to perfect their design. Our high-performance glass excels at limiting solar ray entry but also stops heat escaping during colder weather. Enjoy a room designed for year-round living when you choose Ultraframe. Your new installation will function like any other room in your home, meaning you can use it whenever you want to. Renovate the external appearance of your room by choosing from our range of stunning decorative cornices. Buy from us with confidence, knowing that our 10-year manufacturer’s warranty covers your new house extension. Ask your Ultra Installer for details. Five times more thermally efficient than a brick column, these large green columns in a plain finish are available in any colour to match or contrast with your property. Also available in a fluted finish for a more period style. Add a curved cornice to add style and shape to the roofline and hides the gutters. The Ultraroof roof offers a magnificent vaulted plastered ceiling on the inside with authentic looking lightweight tiles on the outside. Insert full glazed panels to deliver light and a stunning feature. Your new room will be loaded with a range of carefully thought out features that’ll deliver across all important criteria. 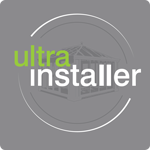 Whether you want to create a kitchen house extension, a new dining area – or other room of your choosing – you’ll be able to discuss a range of choices with your approved Ultra Installer. Our thermally efficient glass will reward you with a house extension that’s perfect for entertaining or relaxing in at any time of year. Choose from a range of coloured glass options, which will each limit solar ray entry but stop heat escaping when it’s needed. Your house extension will contribute to lower U-values and be cost-efficient to run. Although your installation will deliver incredible performance, you’ll still be able to personalise its design by choosing from our portfolio of stunning decorative cornices and much more. Our installations are built to last. If something isn’t right, we’ll be able to correct it. Ask your approved Ultra Installer for details of our 10-year manufacturer’s warranty. Recent surveys reveal that conservatories and house extensions are some of the most rewarding home investments you can make, based on the percentage return on your investment. Right from day one, it will possess impressive strength and solidity, adding a stylish new room to your home. Whatever your preferences, our market-leading products will measure up to your expectations. They combine elements of light and warmth with the solidity of corner columns possessing real inner core strength, plus internal plastered walls and ceilings, to create a ‘real room’ feel. By using only the finest quality materials on the internal specification, our house extensions possess an inner strength and solidity. Super- insulated full height columns –feature additional steelwork and are anchored to the foundations for absolute structural integrity, making it a highly robust addition. The super-insulated columns achieve impressive heat retention with a core of Styropor carbon-enriched EPS, giving you exceptional insulation performance and strength throughout our house extensions. These columns will reward you with thermal efficiency levels five times higher than brick columns of the same size. They can also be integrated with all of our roofs to allow lights and speakers to be added. Your bespoke house extension will look and feel like a natural continuation of your home. The insulated pelmet included will be filled with mineral wool insulation, creating a space that’s warm and comfortable. The insulated pelmet is internally plastered to make it feel like any other room in your home. In many cases, a central lighting panel can be added, into which can be fitted speakers and different types of lighting. Ultraframe house extensions are designed to minimise disruption caused by planning or building regulations. Survey. Your local specialist company will complete a survey at no cost to you and provide guidance concerning your extension’s design. Design & Price. Your chosen Installer will work with you to create a design that’s perfect by sharing images and brochures; they’ll then create a specification and provide a quote. Itinerary. Once you’re happy with the design of your house extension and cost, your Installer Manufacturing. The components used to build your extension will be precision engineered at our manufacturing site and assembled with minimal fuss and mess at your home. Building and Completion. The expert team will quickly install your new extension, treating your home with the respect and minimum mess. 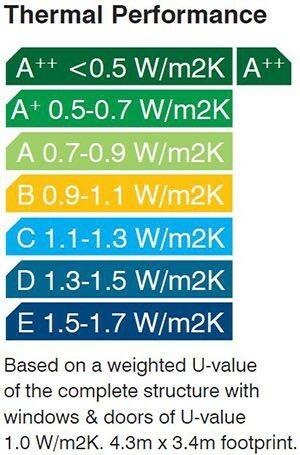 Ultraframe’s products are pre-approved to meet building regulations, so there is less red tape! Enjoy. Living in your warm, bright, thermally efficient space. Wondering what the difference between conservatories and glass extensions is? Look no further. How Does the Thermally Efficient Extension's Internal Heater Work? Find out how to choose the right internal heater for your house extension. What Are the Differences Between Our House Extensions? Explore our range of high-performing house extensions to find out which design best suits your home. Securing the perfect house extension for your home is made easy with our network of Ultra Installers. Before we approve them, all of our Ultraframe specialists are vetted and assessed for their competency, professionalism, reliability, efficiency and promptness. Find your nearest Approved Ultra Installer by using our search tool. You'll benefit from market-leading products, installed by professionals. We heavily invest in the research and development of our home improvement solutions to ensure you get the very best for your property.